I am honored and delighted to be contributing to October Unprocessed today! Andrew Wilder created this fun, thought- provoking challenge three years ago on his terrific blog, Eating Rules. It gives us the opportunity to think about our food choices and how we can “un-process” the way we eat for better health (while keeping it delicious). I am inspired by the motivating posts I’m reading during this month-long movement, and am discovering tasty, creative recipes and helpful tips. 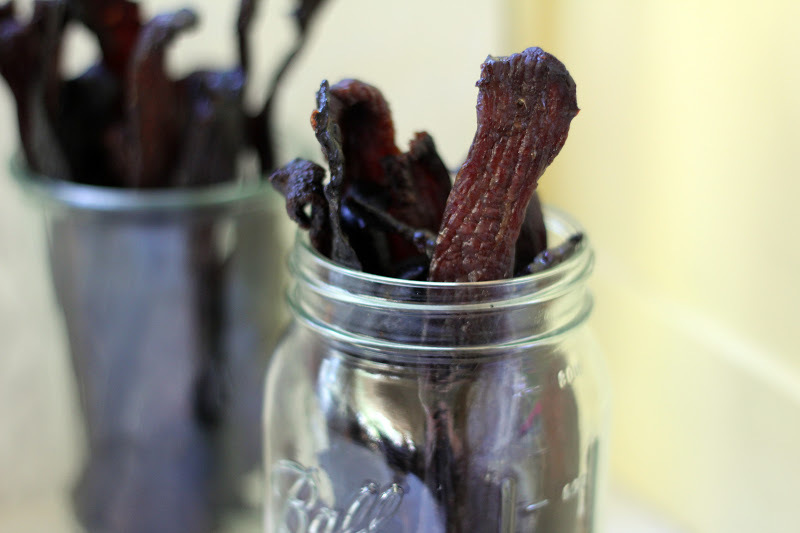 Today, I share one of my family’s favorite unprocessed snacks, Homemade Beef Jerky. Click here to read the full post and recipe. And if you haven’t taken the pledge yet, I encourage you to join in! Thank you, Beth! I even have the Little House cookbook now...I can conjure up Ma's spirit in my kitchen some more. Awesome, Hannah! Whod'a thunk it? How cool is this, I love your hack dIy jerky drying technique, brilliant really. Checked out Eating Rules, what a great site. Great post! Thank you so much, Suzanne! Eating Rules is an awesome site - I love all the creative recipes and tips I discover. Lots of fun! Love! How fabulous....love how you improvised with your oven...great tip! That beef jerky just looks like such a wonderfully savoury wee snack. Thank you, Mairi! We don't have a dehydrator, so got creative with drying the beef. This is definitely a wonderful savory snack! What a great snack to take along or just enjoy at home. I have a dehydrator but only use it for veggies and fruit. Making my own home-made spicy beef jerky is on my list of things to do, now that I got your smart oven rack idea. Thanks for sharing. I love reading your blog. Thank you so much, Chef Moji! Homemade healthy snacks are just the best. I may need to get a dehydrator myself since dried fruit and veggies make such good, easy, portable snacks - not sure the oven rack method would work for those! I hope you enjoy the beef jerky. That was such a great story! This looks awesome, Hannah. What a neat idea! Hi Hannah! Beef Jerky is my husband's favorite and now my son seems to enjoy it. Not homemade though that's why I'm curious to know how to make it. Going to check it out now. Thank you for checking out the post, Nami! Beef jerky is my husband and sons' favorite snack, so I'm happy to have a homemade version to give them. Hopefully your family enjoys it just as much! We were just talking on holidays how we've got to find a recipe for jerky. We're giving yours a try next batch! I'm delighted you're going to try the jerky and hope you enjoy it! Please let me know if you have any questions. I'm just putting a new batch in the oven today. Enjoy the holiday season!